Sea Trail Golf Plantation's Jones Course was designed by Reese Jones to keep players on their toes and having fun throughout all of the 18 holes. 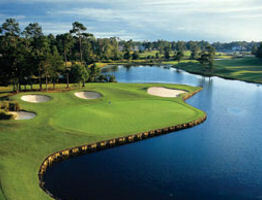 The course features a straightforward design and water poses a hazard on 11 of the holes. The longest tee of the course measures an impressive distance of 6,700 yards so that golfers have the ability to flex their skill and use every club in their bag. The Rees Jones Course never ceases to amaze with all of its captivating beauty and challenges aplenty. Locals and tourists alike who are seeking the most relaxing, yet challenging experience frequent this perennial favorite year after year. Although this course features many typical features that resemble other Rees Jones styles, this course is anything but similar to other courses on the Grand Strand. This unique course contains several expansive pot bunkers just waiting to gobble a player's ball up in its sandy depths while the waters wait to swallow them whole, never to be seen again. Like the other courses at the Sea Trail, this course upholds impressive course length features such as 6,761 yards from the blues, 6,334 yards from the whites, 5,716 yards for the golds, and 4,912 yards from the reds. Avid golfers will enjoy the opportunity for a power shot on the longer holes while beginners will love the opportunity to take part in the challenge and still have a chance at achieving a Par-72. To add to the comfort are wide forgiving fairways although they are surrounded by large blue pools of water. Sea Trail Golf Plantation's Jones Course was designed by Reese Jones to keep players on their toes and having fun throughout all of the 18 holes.